Indiana Kids’ Election attempts to emulate the election process as closely as possible. Students learn to develop good voting habits at an early age by participating in voting milestones such as registering to vote on or before Tuesday, Oct. 9, and casting a ballot on Election Day, Tuesday, Nov. 6, just like their parents. Students can register to vote in your classroom or school election by using the form below. Click here for the student voter registration form that you see below (4/page). Please note: You do not need to submit these voter registration forms to IKE headquarters. We do not track students that have registered to vote. This is simply an exercise for the students to go through in order to emulate the process. 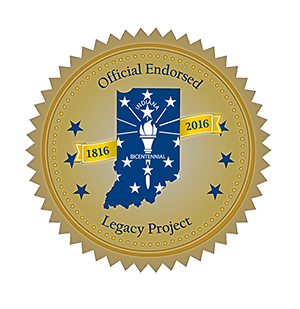 In 2016, the Indiana Bicentennial Commission endorsed the Indiana Kids' Election program as a Bicentennial Legacy Project.